Great Smoky Mountains National Park is celebrating 20 years of conducting biodiversity inventories. Park managers, biologists, educators, and non-park scientists initiated an effort to discover all life in the Smokies through an All Taxa Biodiversity Inventory (ATBI) on Earth Day in 1998. The non-profit partner Discover Life in America (DLIA), created in 1998, coordinates the inventory. Over the last 20 years, biologists have not only documented thousands of plants and animals, but have also identified nearly 1,000 new species previously unknown to science. This scientific effort has produced a baseline for one of the most diverse ecosystems in the United States. Park managers now have a better understanding of the resources, and can better predict how changing conditions in the future may impact them. ATBI information also provides a foundation allowing for future park managers to make better-informed decisions. For more information about special events celebrating the 20th anniversary year of the All Taxa Biodiversity Inventory, please visit DLIA’s website at https://dlia.org/. Great Smoky Mountains National Park officials announced that a paving project will begin the week of April 30 on Newfound Gap Road. Work will take place along the road between the Newfound Gap area south to the park boundary at Cherokee, North Carolina. The project should be completed by September 20, 2018, though work schedules are subject to revision as needed for inclement weather. Visitors traveling on Newfound Gap Road should expect weekday, single-lane closures and traffic delays April 30 through June 16 and again from August 16 through September 20. Lane closures are permitted from 7:00 a.m. on Mondays through 12:00 p.m. on Fridays and will be allowed to hold traffic for up to 10 minutes at a time. The lane closures will be managed with flagging operations and a pilot car to lead traffic through work zones. In addition, some parking areas and pull-offs will be closed intermittently. To better accommodate visitors during periods of high visitation, no daytime lane closures will be allowed on weekends, holidays, or from June 16 through August 15. 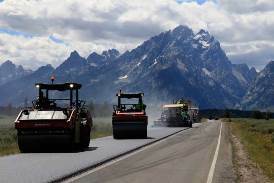 The Federal Highway Administration awarded the $3 million paving contract to Estes Brothers Construction. Roadwork will include the application of a thin lift pavement overlay. Great Smoky Mountains National Park officials have announced the dates for firefly viewing in Elkmont. Shuttle service to the viewing area will be provided on Thursday, June 7 through Thursday, June 14. All visitors wishing to view the synchronous fireflies at Elkmont must have a parking pass distributed through the lottery system at www.recreation.gov. Every year in late May or early June, thousands of visitors gather near the popular Elkmont Campground to observe the naturally occurring phenomenon of Photinus carolinus, a firefly species that flashes synchronously. Since 2006, access to the Elkmont area has been limited to shuttle service beginning at Sugarlands Visitor Center during the eight days of predicted peak activity in order to reduce traffic congestion and provide a safe viewing experience for visitors that minimizes disturbance to these unique fireflies during the critical two-week mating period. The lottery will be open for applications from Friday, April 27 at 12:00 noon until Monday, April 30 at 8:00 p.m. Results of the lottery will be available on Wednesday, May 9. A total of 1,800 vehicle passes will be available for the event which includes: 1768 regular-parking passes (221 per day) which admit one passenger vehicle up to 19’ in length with a maximum of six occupants, and 32 large-vehicle parking passes (four per day) which admit one large vehicle (RV, mini-bus, etc.) from 19’ to 30’ in length, with a maximum of 24 occupants. Lottery applicants must apply for either a regular-parking pass or large-vehicle parking pass and then may choose two possible dates to attend the event over the eight-day viewing period. The lottery system uses a randomized computer drawing to select applications. There is no fee to enter the lottery this year. If selected, the lottery winner will be charged a $20.00 reservation fee and awarded a parking pass. The parking pass permits visitors to park at Sugarlands Visitor Center and allows occupants to access the shuttle service to Elkmont. Parking passes are non-refundable, non-transferable, and good only for the date issued. There is a limit of one lottery application per household per season. All lottery applicants will be notified by e-mail on May 9 that they were “successful” and awarded a parking pass or “unsuccessful” and not able to secure a parking pass. The number of passes issued each day is based primarily on the Sugarlands Visitor Center parking lot capacity and the ability to accommodate a large number of viewers on site. Arrival times will be assigned in order to relieve traffic congestion in the parking lot and also for boarding the shuttles, which are provided in partnership with the City of Gatlinburg. The shuttle buses will begin picking up visitors from the Sugarlands Visitor Center parking area at 7:00 p.m. A $2.00 round-trip, per-person fee will be collected when boarding the shuttle. Cash is the only form of payment accepted. The shuttle service is the only transportation mode for visitor access during this period, except for registered campers staying at the Elkmont Campground. Visitors are not allowed to walk the Elkmont entrance road due to safety concerns. Visitors may visit the website www.recreation.gov and search for “Firefly Event” for more information and to enter the lottery. Parking passes may also be obtained by calling 1-877-444-6777, but park officials encourage the use of the online process. The $20.00 reservation fee covers the cost of awarding the passes, viewing supplies, and nightly personnel costs for managing the viewing opportunity at Sugarlands Visitor Center and Elkmont. For more information about the synchronous fireflies, please visit the park website at http://www.nps.gov/grsm/learn/nature/fireflies.htm. Smoky Mountain starry skies will be the backdrop of Friends of the Smokies’ second annual stargazing event at the Appalachian Highlands Science Learning Center at Purchase Knob. On Friday, May 18, Friends of the Smokies will partner with the Astronomy Club of Asheville to raise money for science education in Great Smoky Mountains National Park. The evening will begin at sundown with live music, dessert, and drinks at Purchase Knob, a grassy bald at more than 5,000 feet in elevation. After dark, the Astronomy Club of Asheville will provide telescopes to view the night sky. Purchase Knob is home to one of a growing network of Research Learning Centers managed by the National Park Service, and hosts schoolchildren from across Western North Carolina and scientists from around the country. The event supports the Kathryn McNeil Endowment, which provides funding for a full time teacher-ranger at the Learning Center. “When young people experience the wonders of the Great Smoky Mountains National Park they forever have a connection to this spectacular place. Parks as Classrooms program ensures that over 15,000 have this opportunity to learn in nature each year. I’m proud that Friends of the Smokies continues to grow the Kathyrn McNeil Endowment, which provides support for this critical program in perpetuity,” says Chase Pickering, Friends of the Smokies Board Member. For more information and tickets ($75), visit FriendsOfTheSmokies.org/donate or call (828)-452-0720. Great Smoky Mountains National Park is again teaming up with the Balsam Mountain Trust for a special program on Birds of Prey at the Oconaluftee Multipurpose Room near the Oconaluftee Visitor Center on Friday, April 20. Michael Skinner, Executive Director of the Balsam Mountain Trust, will conduct an hour-long Birds of Prey program beginning at 11:00 am. This program will provide visitors with an up-close glimpse of some of the planets most recognized and revered wild animals such as the tiny eastern screech owl and northern bald eagle. Balsam Mountain Trust is a local non-profit whose mission is the stewardship of the natural and cultural resources on Balsam Mountain Preserve and the Blue Ridge Mountain region, through effective land management practices, scientific research, and environmental education. The Trust has earned special distinction as a place where non-releasable birds of prey are taken in, cared for, and then utilized as educational ambassadors. The Oconaluftee Multipurpose Room is adjacent to the Oconaluftee Visitor Center on Newfound Gap Road, 2 miles north of Cherokee, North Carolina. 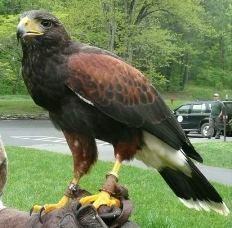 For more information on the upcoming Birds of Prey program, please call the Oconaluftee Visitor Center at (828) 497-1904. 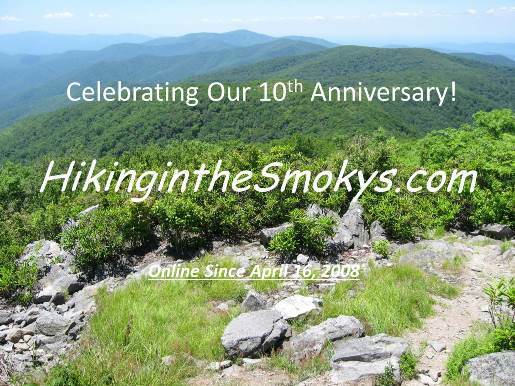 It's hard to believe, but its been 10 years since we launched HikingintheSmokys.com. Building this website has given me an outstanding opportunity to explore dozens of trails in the Great Smoky Mountains that I likely never would've considered in the past - simply because I would've continued hiking the most popular trails. Moreover, this website has given me an opportunity to discover many things about the park that I otherwise probably wouldn't have taken the time to learn, such as its rich and extensive human history, as well as its natural history, including its wide range of flora and fauna. When I first launched this website in 2008 I covered roughly 20 hikes. Today the site covers a total of 67 hikes, and continues to grow each year. 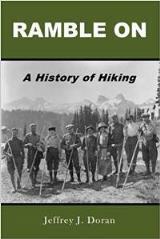 Over the last 10 years I've committed myself to making this the best possible online hiking resource for the Smokies by providing accurate trail descriptions, providing interesting historical anecdotes pertinent to as many trails as possible, and providing photographs that accurately showcase the beauty and the highlights of each hike. Since launching HikingintheSmokys.com in 2008 my wife and I have launched three additional sister websites for three other national parks. They include HikinginGlacier.com in 2011, RockyMountainHikingTrails.com in 2012, and TetonHikingTrails.com in 2014. If you've never had the opportunity to visit any of these parks, I highly recommend all three of them. 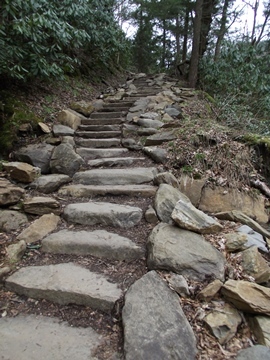 Like the Smokies, each of these parks offer many outstanding hiking opportunities. Thanks to all of you for your support over the years! As part of its ongoing efforts to address aging park infrastructure and improve the visitor experience, the National Park Service (NPS) announced today changes to the entrance fees charged at national parks. The changes, which come in response to public comments on a fee proposal released in October 2017, will modestly increase entrance fees to raise additional revenue to address the $11.6 billion in deferred maintenance across the system of 417 parks, historic and cultural sites, and monuments. Great Smoky Mountains National Park officials announced that the second phase of a 2-year trail rehabilitation project will begin Monday, April 16 on the popular Rainbow Falls Trail. The trail will be closed April 16 through November 15 on Monday mornings at 7:00 a.m. through Thursday evenings at 5:30 p.m. weekly. Due to the construction process on the narrow trail, a full closure is necessary for the safety of both the crew and visitors. The trail will be fully open each week on Friday, Saturday, and Sunday and on federal holidays. Hikers can still reach Mt. Le Conte, LeConte Lodge, and the Le Conte Shelter by using one of the other four open trails to the summit including Alum Cave Trail, Boulevard Trail, Trillium Gap Trail, and the Brushy Mountain Trail. The Mt. LeConte Lodge will remain open and can be accessed from any of these routes during the Rainbow Falls Trail closure. The Bullhead Trail remains closed due to the 2016 wildfire. Aspiring Appalachian Trail (A.T.) hikers now have an opportunity to hone their backcountry skills by participating in “How to Hike the A.T.” backpacking courses. 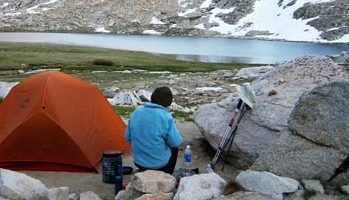 Developed by the Appalachian Trail Conservancy (ATC), these courses are designed to enhance participants’ understanding of important backpacking practices and lead to a lifelong love of hiking. Designed for novice hikers, each course will cost $375 and include all meals and snacks. Participating hikers will be taught by expert ATC staff members and former thru-hikers, exploring important topics such as gear selection, choosing and setting up campsites, and Leave No Trace backcountry principles. Participants will gain first-hand experience in sleeping, cooking, packing efficiently and other important backpacking skills. Course graduates should leave as competent, responsible hikers and have an increased confidence to prepare for future hiking adventures. “These courses will help aspiring thru-hikers move one step closer to achieving their dream of hiking the Appalachian Trail while gaining a new sense of appreciation for the A.T. as a public resource, as well as the work that goes into managing it,” said Chloë de Camara, course instructor and trail education specialist for the ATC. To submit your application and view additional information, including course agendas and gear lists, visit appalachiantrail.org/HikingCourses. The Pisgah National Forest will be holding an open house on Tuesday, April 10 from 5-7 p.m. at the Pisgah Ranger Station to discuss a proposed project to increase the sustainability of recreation. Comments can also be submitted by visiting the Pisgah Ranger Station from 9:00 am-4:30 pm or mailed to Pisgah Ranger District, USDA Forest Service, Attn: Jeff Owenby, 1600 Pisgah Highway, Pisgah Forest, NC. Comments will become part of the project record and may be released under the Freedom of Information Act. To be most useful, please submit comments within the official 30-day scoping period which ends April 27.